As of 2011, herbicide-resistant GM corn was grown in 14 countries. By 2012, 26 varieties herbicide-resistant GM maize were authorised for import into the European Union., but such imports remain controversial. Cultivation of herbicide-resistant corn in the EU provides substantial farm-level benefits. Bt corn is a variant of maize that has been genetically altered to express one or more proteins from the bacterium Bacillus thuringiensis including Delta endotoxins. The protein is poisonous to certain insect pests. Spores of the bacillus are widely used in organic gardening, although GM corn is not considered organic. The European corn borer causes about a billion dollars in damage to corn crops each year. In recent years, traits have been added to ward off corn ear worms and root worms, the latter of which annually causes about a billion dollars in damages. The Bt protein is expressed throughout the plant. When a vulnerable insect eats the Bt-containing plant, the protein is activated in its gut, which is alkaline. In the alkaline environment the protein partially unfolds and is cut by other proteins, forming a toxin that paralyzes the insect's digestive system and forms holes in the gut wall. The insect stops eating within a few hours and eventually starves. In 1996, the first GM maize producing a Bt Cry protein was approved, which killed the European corn borer and related species; subsequent Bt genes were introduced that killed corn rootworm larvae. Approved Bt genes include single and stacked (event names bracketed) configurations of: Cry1A.105 (MON89034), CryIAb (MON810), CryIF (1507), Cry2Ab (MON89034), Cry3Bb1 (MON863 and MON88017), Cry34Ab1 (59122), Cry35Ab1 (59122), mCry3A (MIR604), and Vip3A (MIR162), in both corn and cotton. :285ff Corn genetically modified to produce VIP was first approved in the US in 2010. In 2018 a study found that Bt-corn protected nearby fields of non-Bt corn and nearby vegetable crops, reducing the use of pesticides on those crops. Data from 1976-1996 (before Bt corn was widespread) was compared to data after it was adopted (1996-2016). They examined levels of the European corn borer and corn earworm. Their larvae eat a variety of crops, including peppers and green beans. Between 1992 and 2016, the amount of insecticide applied to New Jersey pepper fields decreased by 85 percent. Another factor was the introduction of more effective pesticides that were applied less often. GM sweet corn varieties include "Attribute", the brand name for insect-resistant sweet corn developed by Syngenta and Performance Series™ insect-resistant sweet corn developed by Monsanto. In 2013 Monsanto launched the first transgenic drought tolerance trait in a line of corn hybrids called DroughtGard. The MON 87460 trait is provided by the insertion of the cspB gene from the soil microbe Bacillus subtilis; it was approved by the USDA in 2011 and by China in 2013. Research has been done on adding a single E. coli gene to maize to enable it to be grown with an essential amino acid (methionine). In regular corn crops, insects promote fungal colonization by creating "wounds," or holes, in corn kernels. These wounds are favored by fungal spores for germination, which subsequently leads to mycotoxin accumulation in the crop. This can prove to be especially devastating in developing countries with drastic climate patterns such as high temperatures, which favor the development of toxicogenic fungi. In addition, higher mycotoxin levels may lead to market rejection of the grain. GM corn crops encounter less insect attacks, and thus, have lower concentrations of mycotoxins. Less insect attacks also keep corn ears from being damaged, which increases overall yields. In 2007, South African researchers announced the production of transgenic maize resistant to maize streak virus (MSV), although it has not been released as a product. While breeding cultivars for resistance to MSV isn't done in the public, the private sector, international research centers, and national programmes have done all of the breeding. US Environmental Protection Agency (EPA) regulations require farmers who plant Bt corn to plant non-Bt corn nearby (called a refuge) to provide a location to harbor vulnerable pests. Typically, 20% of corn in a grower's fields must be refuge; refuge must be at least 0.5 miles from Bt corn for lepidopteran pests, and refuge for corn rootworm must at least be adjacent to a Bt field. The theory behind these refuges is to slow the evolution of resistance to the pesticide. EPA regulations also require seed companies to train farmers how to maintain refuges, to collect data on the refuges and to report that data to the EPA. A study of these reports found that from 2003 to 2005 farmer compliance with keeping refuges was above 90%, but that by 2008 approximately 25% of Bt corn farmers did not keep refuges properly, raising concerns that resistance would develop. Unmodified crops received most of the economic benefits of Bt corn in the US in 1996-2007, because of the overall reduction of pest populations. This reduction came because females laid eggs on modified and unmodified strains alike. Seed bags containing both Bt and refuge seed have been approved by the EPA in the United States. These seed mixtures were marketed as "Refuge in a Bag" (RIB) to increase farmer compliance with refuge requirements and reduce additional work needed at planting from having separate Bt and refuge seed bags on hand. The EPA approved a lower percentage of refuge seed in these seed mixtures ranging from 5 to 10%. This strategy is likely to reduce the likelihood of Bt-resistance occurring for corn rootworm, but may increase the risk of resistance for lepidopteran pests, such as European corn borer. Increased concerns for resistance with seed mixtures include partially resistant larvae on a Bt plant being able to move to a susceptible plant to survive or cross pollination of refuge pollen on to Bt plants that can lower the amount of Bt expressed in kernels for ear feeding insects. Resistant strains of the European corn borer have developed in areas with defective or absent refuge management. In November 2009, Monsanto scientists found the pink bollworm had become resistant to first-generation Bt cotton in parts of Gujarat, India – that generation expresses one Bt gene, Cry1Ac. This was the first instance of Bt resistance confirmed by Monsanto anywhere in the world. Bollworm resistance to first generation Bt cotton has been identified in Australia, China, Spain, and the United States. In 2012, a Florida field trial demonstrated that army worms were resistant to pesticide-containing GM corn produced by Dupont-Dow; armyworm resistance was first discovered in Puerto Rico in 2006, prompting Dow and DuPont to voluntarily stop selling the product on the island. Regulation of GM crops varies between countries, with some of the most-marked differences occurring between the USA and Europe. Regulation varies in a given country depending on intended uses. The scientific rigor of the studies regarding human health has been disputed due to alleged lack of independence and due to conflicts of interest involving governing bodies and some of those who perform and evaluate the studies. GM crops provide a number of ecological benefits, but there are also concerns for their overuse, stalled research outside of the Bt seed industry, proper management and issues with Bt resistance arising from their misuse. Critics have objected to GM crops on ecological, economic and health grounds. The economic issues derive from those organisms that are subject to intellectual property law, mostly patents. The first generation of GM crops lose patent protection beginning in 2015. Monsanto has claimed it will not pursue farmers who retain seeds of off-patent varieties. These controversies have led to litigation, international trade disputes, protests and to restrictive legislation in most countries. Critics claim that Bt proteins could target predatory and other beneficial or harmless insects as well as the targeted pest. These proteins have been used as organic sprays for insect control in France since 1938 and the USA since 1958 with no ill effects on the environment reported. While cyt proteins are toxic towards the insect order Diptera (flies), certain cry proteins selectively target lepidopterans (moths and butterflies), while other cyt selectively target Coleoptera. As a toxic mechanism, cry proteins bind to specific receptors on the membranes of mid-gut (epithelial) cells, resulting in rupture of those cells. Any organism that lacks the appropriate gut receptors cannot be affected by the cry protein, and therefore Bt. Regulatory agencies assess the potential for the transgenic plant to impact nontarget organisms before approving commercial release. A 1999 study found that in a lab environment, pollen from Bt maize dusted onto milkweed could harm the monarch butterfly. Several groups later studied the phenomenon in both the field and the laboratory, resulting in a risk assessment that concluded that any risk posed by the corn to butterfly populations under real-world conditions was negligible. A 2002 review of the scientific literature concluded that "the commercial large-scale cultivation of current Bt–maize hybrids did not pose a significant risk to the monarch population". A 2007 review found that "nontarget invertebrates are generally more abundant in Bt cotton and Bt maize fields than in nontransgenic fields managed with insecticides. However, in comparison with insecticide-free control fields, certain nontarget taxa are less abundant in Bt fields." In 2009 the government of Mexico created a regulatory pathway for genetically modified maize, but because Mexico is the center of diversity for maize, gene flow could affect a large fraction of the world's maize strains. A 2001 report in Nature presented evidence that Bt maize was cross-breeding with unmodified maize in Mexico. The data in this paper was later described as originating from an artifact. Nature later stated, "the evidence available is not sufficient to justify the publication of the original paper". A 2005 large-scale study failed to find any evidence of contamination in Oaxaca. 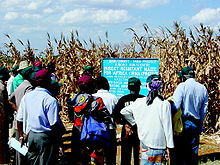 However, other authors also found evidence of cross-breeding between natural maize and transgenic maize. A 2004 study found Bt protein in kernels of refuge corn. In 2017, a large-scale study found "pervasive presence of transgenes and glyphosate in maize-derived food in Mexico"
The French High Council of Biotechnologies Scientific Committee reviewed the 2009 Vendômois et al. study and concluded that it "..presents no admissible scientific element likely to ascribe any haematological, hepatic or renal toxicity to the three re-analysed GMOs." However, the French government applies the precautionary principle with respect to GMOs. A review by Food Standards Australia New Zealand and others of the same study concluded that the results were due to chance alone. A 2011 Canadian study looked at the presence of CryAb1 protein (BT toxin) in non-pregnant women, pregnant women and fetal blood. All groups had detectable levels of the protein, including 93% of pregnant women and 80% of fetuses at concentrations of 0.19 ± 0.30 and 0.04 ± 0.04 mean ± SD ng/ml, respectively. The paper did not discuss safety implications or find any health problems. The paper was found to be unconvincing by multiple authors and organizations. In a swine model, Cry1Ab-specific antibodies were not detected in pregnant sows or their offspring and no negative effects from feeding Bt maize to pregnant sows were observed. In January 2013, the European Food Safety Authority released all data submitted by Monsanto in relation to the 2003 authorisation of maize genetically modified for glyphosate tolerance. StarLink corn was subsequently found in food destined for consumption by humans in the US, Japan, and South Korea. :20–21 This corn became the subject of the widely publicized Starlink corn recall, which started when Taco Bell-branded taco shells sold in supermarkets were found to contain the corn. Sales of StarLink seed were discontinued. The registration for Starlink varieties was voluntarily withdrawn by Aventis in October 2000. Pioneer had been bought by AgrEvo which then became Aventis CropScience at the time of the incident,:15–16 which was later bought by Bayer. Fifty-one people reported adverse effects to the FDA; US Centers for Disease Control (CDC), which determined that 28 of them were possibly related to Starlink. However, the CDC studied the blood of these 28 individuals and concluded there was no evidence of hypersensitivity to the Starlink Bt protein. A subsequent review of these tests by the Federal Insecticide, Fungicide, and Rodenticide Act Scientific Advisory Panel points out that while "the negative results decrease the probability that the Cry9C protein is the cause of allergic symptoms in the individuals examined ... in the absence of a positive control and questions regarding the sensitivity and specificity of the assay, it is not possible to assign a negative predictive value to this." The US corn supply has been monitored for the presence of the Starlink Bt proteins since 2001. In 2005, aid sent by the UN and the US to Central American nations also contained some StarLink corn. The nations involved, Nicaragua, Honduras, El Salvador and Guatemala refused to accept the aid. On December 19, 2013 six Chinese citizens were indicted in Iowa on charges of plotting to steal genetically modified seeds worth tens of millions of dollars from Monsanto and DuPont. Mo Hailong, director of international business at the Beijing Dabeinong Technology Group Co., part of the Beijing-based DBN Group, was accused of stealing trade secrets after he was found digging in an Iowa cornfield. ^ a b Tan S, Evans RR, Dahmer ML, Singh BK, Shaner DL (March 2005). "Imidazolinone-tolerant crops: history, current status and future". Pest Management Science. 61 (3): 246–57. doi:10.1002/ps.993. PMID 15627242. ^ Planta J, Xiang X, Leustek T, Messing J (October 2017). "Engineering sulfur storage in maize seed proteins without apparent yield loss". Proceedings of the National Academy of Sciences of the United States of America. 114 (43): 11386–11391. doi:10.1073/pnas.1714805114. PMC 5664557. PMID 29073061. ^ Pellegrino E, Bedini S, Nuti M, Ercoli L (February 2018). "Impact of genetically engineered maize on agronomic, environmental and toxicological traits: a meta-analysis of 21 years of field data". Scientific Reports. 8 (1): 3113. doi:10.1038/s41598-018-21284-2. PMC 5814441. PMID 29449686. ^ Shepherd DN, Mangwende T, Martin DP, Bezuidenhout M, Kloppers FJ, Carolissen CH, Monjane AL, Rybicki EP, Thomson JA (November 2007). "Maize streak virus-resistant transgenic maize: a first for Africa". Plant Biotechnology Journal. 5 (6): 759–67. CiteSeerX 10.1.1.584.7352. doi:10.1111/j.1467-7652.2007.00279.x. PMID 17924935. ^ Pratt R, Gordon S, Lipps P, Asea G, Bigirwa G, Pixley K (June 2003). "Use of IPM in the control of multiple diseases in maize: strategies for selection of host resistance". African Crop Science Journal. 11 (3): 189–98. doi:10.4314/acsj.v11i3.27570. ^ a b Tabashnik BE (October 2010). "Plant science. Communal benefits of transgenic corn". Science. 330 (6001): 189–90. doi:10.1126/science.1196864. PMID 20929767. ^ Siegfried BD, Hellmich RL (2012). "Understanding successful resistance management: the European corn borer and Bt corn in the United States". GM Crops & Food. 3 (3): 184–93. doi:10.4161/gmcr.20715. PMID 22688691. ^ Devos Y, Meihls LN, Kiss J, Hibbard BE (April 2013). "Resistance evolution to the first generation of genetically modified Diabrotica-active Bt-maize events by western corn rootworm: management and monitoring considerations". Transgenic Research. 22 (2): 269–99. doi:10.1007/s11248-012-9657-4. PMID 23011587. ^ Bagla P (March 2010). "India. Hardy cotton-munching pests are latest blow to GM crops". Science. 327 (5972): 1439. Bibcode:2010Sci...327.1439B. doi:10.1126/science.327.5972.1439. PMID 20299559. ^ Tabashnik BE, Gassmann AJ, Crowder DW, Carriére Y (February 2008). "Insect resistance to Bt crops: evidence versus theory". Nature Biotechnology. 26 (2): 199–202. doi:10.1038/nbt1382. PMID 18259177. Krimsky, Sheldon (2015). "An Illusory Consensus behind GMO Health Assessment" (PDF). Science, Technology, & Human Values. 40 (6): 883–914. doi:10.1177/0162243915598381. I began this article with the testimonials from respected scientists that there is literally no scientific controversy over the health effects of GMOs. My investigation into the scientific literature tells another story. ^ National Academies Of Sciences, Engineering; Division on Earth Life Studies; Board on Agriculture Natural Resources; Committee on Genetically Engineered Crops: Past Experience Future Prospects (2016). Genetically Engineered Crops: Experiences and Prospects. The National Academies of Sciences, Engineering, and Medicine (US). p. 149. doi:10.17226/23395. ISBN 978-0-309-43738-7. PMID 28230933. Retrieved May 19, 2016. Overall finding on purported adverse effects on human health of foods derived from GE crops: On the basis of detailed examination of comparisons of currently commercialized GE with non-GE foods in compositional analysis, acute and chronic animal toxicity tests, long-term data on health of livestock fed GE foods, and human epidemiological data, the committee found no differences that implicate a higher risk to human health from GE foods than from their non-GE counterparts. ^ "Fields of gold". Nature News & Comment. 497 (7447): 5–6. 2013. doi:10.1038/497005b. Retrieved 28 October 2014. ^ Al-Deeb, Mohammad A.; Wilde, Gerald E.; Blair, John M.; Todd, Tim C. (2003). "Effect ofBtCorn for Corn Rootworm Control on Nontarget Soil Microarthropods and Nematodes". Environmental Entomology. 32 (4): 859–865. doi:10.1603/0046-225x-32.4.859. ^ Dorsch, J.A. ; et al. (2002). "Cry1a Toxins of Bacillus Thuringiensis Bind Specifically to a Region Adjacent to the Membrane-Proximal Extracellular Domain of Bt-R-1 in Manduca Sexta: Involvement of a Cadherin in the Entomopathogenicity of Bacillus Thuringiensis". Insect Biochemistry and Molecular Biology. 32 (9): 1025–1036. doi:10.1016/s0965-1748(02)00040-1. ^ Romeis J, Hellmich RL, Candolfi MP, Carstens K, De Schrijver A, Gatehouse AM, Herman RA, Huesing JE, McLean MA, Raybould A, Shelton AM, Waggoner A (February 2011). "Recommendations for the design of laboratory studies on non-target arthropods for risk assessment of genetically engineered plants". Transgenic Research. 20 (1): 1–22. doi:10.1007/s11248-010-9446-x. PMC 3018611. PMID 20938806. ^ Romeis J, Bartsch D, Bigler F, Candolfi MP, Gielkens MM, Hartley SE, Hellmich RL, Huesing JE, Jepson PC, Layton R, Quemada H, Raybould A, Rose RI, Schiemann J, Sears MK, Shelton AM, Sweet J, Vaituzis Z, Wolt JD (February 2008). "Assessment of risk of insect-resistant transgenic crops to nontarget arthropods". Nature Biotechnology. 26 (2): 203–8. doi:10.1038/nbt1381. PMID 18259178. ^ Sears MK, Hellmich RL, Stanley-Horn DE, Oberhauser KS, Pleasants JM, Mattila HR, Siegfried BD, Dively GP (October 2001). "Impact of Bt corn pollen on monarch butterfly populations: a risk assessment". Proceedings of the National Academy of Sciences of the United States of America. 98 (21): 11937–42. Bibcode:2001PNAS...9811937S. doi:10.1073/pnas.211329998. JSTOR 3056827. PMC 59819. PMID 11559842. ^ Gatehouse AM, Ferry N, Raemaekers RJ (May 2002). "The case of the monarch butterfly: a verdict is returned" (PDF). Trends in Genetics. 18 (5): 249–51. doi:10.1016/S0168-9525(02)02664-1. PMID 12047949. ^ Marvier M, McCreedy C, Regetz J, Kareiva P (June 2007). "A meta-analysis of effects of Bt cotton and maize on nontarget invertebrates". Science. 316 (5830): 1475–7. Bibcode:2007Sci...316.1475M. doi:10.1126/science.1139208. PMID 17556584. ^ Quist D, Chapela IH (November 2001). "Transgenic DNA introgressed into traditional maize landraces in Oaxaca, Mexico". Nature. 414 (6863): 541–3. Bibcode:2001Natur.414..541Q. doi:10.1038/35107068. PMID 11734853. ^ Kaplinsky N, Braun D, Lisch D, Hay A, Hake S, Freeling M (April 2002). "Biodiversity (Communications arising): maize transgene results in Mexico are artefacts". Nature. 416 (6881): 601–2, discussion 600, 602. Bibcode:2002Natur.416..601K. doi:10.1038/nature739. PMID 11935145. ^ Ortiz-García S, Ezcurra E, Schoel B, Acevedo F, Soberón J, Snow AA (August 2005). "Absence of detectable transgenes in local landraces of maize in Oaxaca, Mexico (2003-2004)". Proceedings of the National Academy of Sciences of the United States of America. 102 (35): 12338–43. Bibcode:2005PNAS..10212338O. doi:10.1073/pnas.0503356102. PMC 1184035. PMID 16093316. ^ Piñeyro-Nelson A, Van Heerwaarden J, Perales HR, Serratos-Hernández JA, Rangel A, Hufford MB, Gepts P, Garay-Arroyo A, Rivera-Bustamante R, Alvarez-Buylla ER (February 2009). "Transgenes in Mexican maize: molecular evidence and methodological considerations for GMO detection in landrace populations". Molecular Ecology. 18 (4): 750–61. doi:10.1111/j.1365-294X.2008.03993.x. PMC 3001031. PMID 19143938. ^ Chilcutt CF, Tabashnik BE (May 2004). "Contamination of refuges by Bacillus thuringiensis toxin genes from transgenic maize". Proceedings of the National Academy of Sciences of the United States of America. 101 (20): 7526–9. Bibcode:2004PNAS..101.7526C. doi:10.1073/pnas.0400546101. PMC 419639. PMID 15136739. ^ Doull J, Gaylor D, Greim HA, Lovell DP, Lynch B, Munro IC (November 2007). "Report of an Expert Panel on the reanalysis by of a 90-day study conducted by Monsanto in support of the safety of a genetically modified corn variety (MON 863)" (PDF). Food and Chemical Toxicology. 45 (11): 2073–85. doi:10.1016/j.fct.2007.08.033. PMID 17900781. The Se´ralini et al. reanalysis does not advance any new scientific data to indicate that MON 863 caused adverse effects in the 90-day rat study. ^ Aris A, Leblanc S (May 2011). "Maternal and fetal exposure to pesticides associated to genetically modified foods in Eastern Townships of Quebec, Canada". Reproductive Toxicology. 31 (4): 528–33. doi:10.1016/j.reprotox.2011.02.004. PMID 21338670. ^ Buzoianu SG, Walsh MC, Rea MC, O'Donovan O, Gelencsér E, Ujhelyi G, Szabó E, Nagy A, Ross RP, Gardiner GE, Lawlor PG (2012). Bravo A (ed.). "Effects of feeding Bt maize to sows during gestation and lactation on maternal and offspring immunity and fate of transgenic material". PLOS One. 7 (10): e47851. Bibcode:2012PLoSO...747851B. doi:10.1371/journal.pone.0047851. PMC 3473024. PMID 23091650.